Black Caiman Skull. Replica. 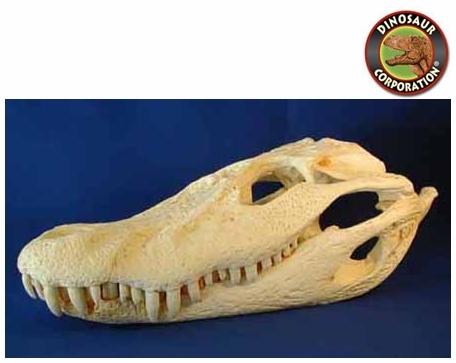 Alligatorinae, Melanosuchus niger; Lake and river areas of the Amazon basin and coastal rivers of NE South America. The Black Caiman (Melanosuchus niger) is a threatened species, related to alligators. It is a carnivorous reptile that lives along slow-moving rivers and lakes, in the seasonally flooded savannas of the Amazon basin, and in other freshwater habitats in South America. Once common, it was hunted to near extinction primarily for its commercially valuable hide. The black caiman can grow to 20 feet long (6 meters) and 1 100 kg weight (2 300 lb), making it the largest member of the Caiman family and the largest predator in the Amazon basin. Black caiman predators are mostly humans who kill them for its skin.